Trowles, Peter (2009) Adapting to Change at the Glasgow School of Art: Living with the interiors of Charles Rennie Mackintosh. 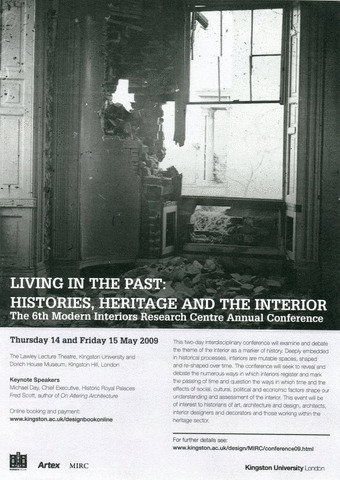 In: Living in the Past: Histories, Heritage and the Interior, 14-15 May 2009, Kingston University, UK. For the first sixty years the Glasgow School of Art’s main campus building, designed by Charles Rennie Mackintosh between 1897 and 1909, operated solely as a teaching facility. Then on 6 July 1966 the so-called ‘Mackintosh building’ was awarded statuary listing from Historic Scotland and the City of Glasgow Council as a Category ‘A’ Listed Building. Importantly, the School of Art’s function as an educational institution did not change overnight. In fact, since 1966 the Mackintosh building’s listed status has not altered the School’s primary commitment to teaching at all. Nevertheless, the key task recently has been one of adapting the physical structure of what is chiefly a late 19th, early 20th century building so that it can meet the growing educational needs of a 21st century school, whilst also recognising that it is no longer just a ‘regular’ art school, rather an art school now widely viewed as being of ‘international heritage significance’ as well. The official statuary listing identified the Mackintosh building’s interior as “….Glasgow School detailing throughout… with original fittings and furniture”. Now in 2009 as the School celebrates the 100th anniversary of the building’s completion, how does it intend to meet the seemingly conflicting tasks of maintaining its educational responsibility whilst recognising the true importance of its historic interiors? Should the widely recognised and highly significant Mackintosh-designed library, for instance, be seen simply as a learning resource, as it always was, or should it be viewed today as first and foremost an important heritage interior, or is it possible to find a middle-ground that satisfies the School’s commitment to both education and heritage and all under the one roof?